"Nessa O'Mahony's writing is subtle and precise and this fine book crackles with truthfulness. But even more importantly, this is a work of great beauty, a story of how past and present flow into one another all the time. It's a moving, powerful and richly pleasurable read, audaciously imagined and achieved." "This is the best verse-novel I've read in years, a many-stranded docu-fiction inspired by a real archive of unpublished correspondence recording the Australian adventures of the emigrant Butlers of Kilkenny. Personal letters, with their brisk, vivid authenticity, contrast with brilliantly convincing poems created by O'Mahony in the personae of the long-suffering protagonist, Margaret, and her smart young serving-girl, Lizzie. But this is only part of the story. The nineteenth-century tale is made to resonate within a strong, contemporary, framing narrative centered on Fiona Sheehan, an engaging, feisty, Dublin woman-writer who discovers the archive, love, and North Wales on her own journey of emigration and return. In Sight of Home is a truly original work which sets new standards and breaks new ground in the verse-novel, while at the same time inviting us into an effortlessly entertaining and ultimately profoundly moving 'good read.'" Nessa O'Mahony was born and lives in Dublin. Her poetry has appeared in a number of Irish, UK, and North American periodicals, has been translated into several European languages. She won the National Women's Poetry Competition in 1997 and was subsequently shortlisted for the Patrick Kavanagh Prize and Hennessy Literature Awards. Her first poetry collection, Bar Talk, was published by iTaLiCs Press in 1999. Her second, Trapping a Ghost, was published by bluechrome publishing in 2005. She was awarded an Irish Arts Council literature bursary in 2004 and an Artist's Bursary from South Dublin County Council in 2007. She is currently Artist in Residence at the John Hume Institute for Global Irish Studies, University College, Dublin. She is Assistant Editor of UK literary journal Orbis. Nessa O'Mahony's In Sight Of Home (like yesterday, from Salmon Poetry, an Irish press) breaks new ground, both in its choice of form and in its choice of genre. It will be filed, because of its publisher, under poetry, I guess, but it could equally find a home in fiction and biography. It's a bold writer who composes a verse novel - Pushkin, Nabokov, Vikram Seth are the big names - or a verse biography (Ruth Padel has worked in this field). But this isn't either of them. It mixes prose and poetry, and it freely mixes known fact, in the shape of a cache of letters written in the mid-nineteenth century by Margaret Butler, from Kilkenny, from Australia, with a fictional writer from the early twenty-first century, Fiona Sheehan, who is conducting her own journey, away from Dublin to North Wales, and who is working on the letters and turning them into her own poems. This is a really complicated echo-chamber - after all, we don't know if Nessa O'Mahony is in any way, shape or form the alter ego of Sheehan; we don't know (and O'Mahony isn't telling) which of the Butler letters are made up, and which are original; we have to see if we can skip between the two journeys of (self-)exploration; and, just to keep the mixture rich, we are even given occasional notes by Sheehan about the defects in her poetry, poetry, of course, with which O'Mahony has provided her. And one can easily add to this sense that everything is a bit odd - after all, Ireland, 1850s, potato famine, isn't it? O'Mahony is having none of this. She presents us with an altogether other kind of historical fact, that of fairly prosperous Irish families going to make a new life. Is it a bird, is it a plane, is it a verse novel? None of the above. What really works is the cutting between one genre and another, one time and another, and (best of all) the way that minor characters start working their way into the foreground. Chief amongst these is Lizzie Murphy, an almost extraneous figure at first, an orphan Irish girl who finds her way to Australia and into service with the Butler family, before marrying into it. Lizzie's narrative seems so clearly distinct from Margaret's and Fiona's that it almost a shock to find, much later, that she is Fiona's creation. In some ways, I think it is the situations more than the characters which grab the reader - the various culture shocks which are encountered, the way in which the main figures are separated from what they know, the way they become entangled with what was and what is, the way they become mixed up (so it is the structure, too, of In Sight Of Home that engages the reader, the ambition of asking the reader to consider on the one hand a rather hapless encounter between a fizzing present day media woman with a chaotic Welsh academic; and on the other hand, the doubly parallel universe - in time and space - of the women in Australia). This is a really challenging read. Narrative free verse is incredibly hard to do (arguably the hardest of all genres), and also the hardest to sustain. Mixing in the letters keeps the readers on their mettle. One moment you're with Fiona's aspiration to have a cat and feed it Whiskas, the next you're in the outback, writing very proper letters to a cousin. Complexity can be a curse. Not here. You have to go back and read it a second time, a third. I thought it was astonishing. It'll cost you fifteen euros. Go on, go on. This beautiful collection of poetry from Dublin poet O'Mahony is inspired by a real archive of unpublished correspondence recording the Australian adventures of the emigrant Butlers of Kilkenny. Evocative, touching and subtle this is an outstanding read where the personal letters of the past contrast with unique verse of the present. All of us are traveling - at some point in our lives - whether we want to or not. Strangely enough, we often travel in tandem with others at different times - say, like, in centuries, or even eras, and Nessa O'Mahony's, In Sight of Home, a novel in verse, unevenly and successfully illustrates this concept. Home tells the story- through letters, journal excerpts, and poetry, of two, actually, three women - Margaret, Lizzy, and Fiona - searching for personal, and, in Fiona's case, professional fulfillment. In the beginning of Home, Fiona, a writer/poet, discovers the story of Margaret Butler and her serving girl Lizzie, two women who emigrated (based on actual historical accounts of the Butler family) from Mother Ireland to Australia at the latter half of the 1800's. Various personal issues, and what seems to be an overwhelming case of ennui force Fiona, along with her treasure trove of letters, to pull up stakes from Ireland to resettle in Wales. It's worth noting that in the United States, the Irish diaspora to America has been documented to death through various books and films, but not so much their immigration to Australia/New Zealand. With the notable exception of Colleen McCullough's watershed victory of The Thorn Birds (Richard Chamberlain wasn't fooling anyone back then), I, in my limited literary travels, I haven't come across much, and it's refreshing, as the third generation descendent of Irish immigrants, to read another version of the tale. has no claims on me. with visits, teddies, the odd poem. to wait a while longer. In Sight of Home is an ambitious work, combining vastly different literary genres, as well as different eras into a provocative and rewarding read. O'Mahony has set the literary bar higher with her new offering regarding the universal and ongoing story of womanhood. It's enough to inspire me to consider writing a novel in verse (considering at this stage only), and it's given me a whole new appreciation for the depth and bravery of O'Mahony as a poet, in that she is fearless, and evolved enough, to take risks. Review: All poetry's children by Kevin Higgins. The Galway Advertiser, December 03, 2009. 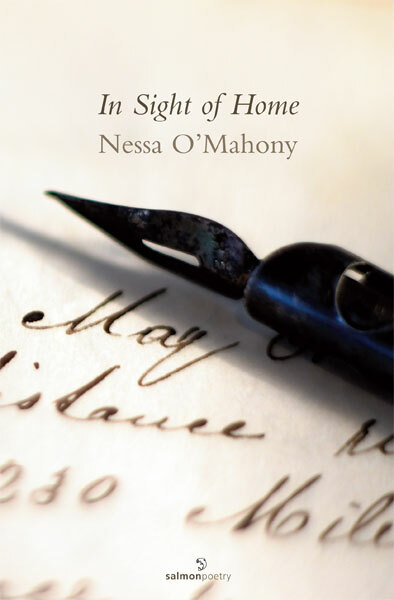 In Sight of Home by Nessa O'Mahony (Salmon Poetry) is a moving verse-novel about the Butler family who emigrated to Australia in 1854. The opening lines of 'Orphan' made me reflect that in 2009 - this year of endless complaint - we have perhaps grown just a little whiney. The narrator is writing from Loughrea Workhouse in September 1847: "I wasn't born here,/but don't remember any other home./Ma brought us in one winter/when our stomachs got too loud,/she died soon after." The book takes the form of letters from her protagonists - some in verse, some in prose. The diary entries by Fiona Sheehan, a Dublin writer using the archives to track down her ancestors, make the world of the 1850s and the world of 2003 collide very beautifully here.